If you don’t have a few dents, you haven’t been doing enough. Ideally we could play hard for our entire lives’ without so much as a scrape. But that’s not the way things work out. I was able to come back to 100% from every injury, until the shoulder. After surgery and the initial rehab to recover range of motion I stalled out. I needed strength training, but all the methods of weight lifting and circuit work in the gym I used in the past were getting me nowhere. One day when I was especially frustrated after a failed workout, my wife Barbara suggested I try PIlates. Since I usually do as she says, I found myself at the mercy of her Pilates teacher Marion Wright soon enough. By the end of the hour I knew this was the path which would get me back to mountain sports. A more profound realization came later: if I had learned about Pilates earlier I could have avoided the shoulder injury altogether. I did my training and certification as a Pilates teacher at Core Conditioning in Los Angeles. Core is among a few cutting edge physical therapy groups to see the power of Pilates Method exercises for rehabilitation. After my certification I joined the staff as a physical therapy aide, so I was called on to work with patients using Pilates and related techniques at the direction of their therapist. I learned how to modify the exercises to suit various people’s special conditions, how to design a program suited to each person’s needs, and how to progress the program of exercises as a person gains strength and ability. At the same time I pushed my own workouts to an advanced level by training with one of the area’s top teachers, Roger Gonzalez-Hibner. I continue to work out with Roger weekly. To be clear: I am not a physical therapist. I am a Pilates teacher with a background of working with therapists. If you are where I was after shoulder surgery – ready to move from physical therapy to training for your sport – this is where I can help. My background and training enable me to have an intelligent conversation with your therapist about your special conditions and report back regarding your progress. The other side of the coin is avoiding injury in the first place, and with my training in postural assessment, body alignment and lumbar-pelvic stability I can teach you a Pilates program which will make you functionally strong. You will stand taller, enjoy improved posture and balance, feel better and look better. I’ll wrap this up with a final point. One of the most important things for a trainer to understand is what is and what is not within the scope of their practice. I have, on more than one occasion referred a client coming to me for Pilates out to a physical therapist or an MD because of things I saw which I knew I was not qualified to assess and work on safely. The safety and well being of my clients is my number one priority. 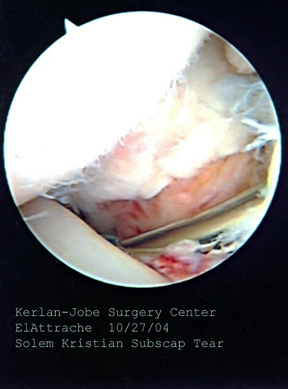 Just for fun, here’s a view of my right shoulder through the arthroscope of Dr. Neal El’Attrache in October, 2004.